Atmospheric blocking leads to a stagnation of weather patterns. As you are well aware, atmospheric patterns tend to repeat themselves. In the case of blocking, the same pattern repeats for several days to even weeks. This can lead to flooding, drought, above normal temperatures, below normal temperatures and other weather extremes. It is important to recognize a blocking pattern in its initial development. With this awareness, you will be able to forecast out to several days in advance with a high degree of accuracy. Atmospheric blocking is best seen on upper air analysis and forecast charts. 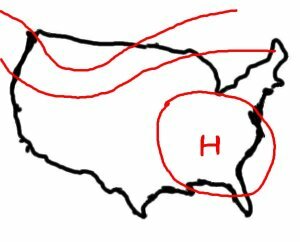 Blocking over large regions is most common with high-pressure since high pressure covers a large spatial area and tends to move slower than low pressure. In some instances, low pressure can also cause an atmospheric block. The five types of blocks that will be represented in this section are the Omega block, the Rex block, the Ring of Fire, Split flow and the Cut-off low. Each is detailed separately. Air over the Southwest U.S. in forced to the north into Canada and then back south into the Southeast U.S. by the huge high-pressure ridge in the center of the country. The region under the omega block experiences dry weather and light wind for an extended period of time while rain and clouds are common in association with the two troughs on either side of the omega block. Omega blocks make forecasting easier since you can pinpoint areas that will be dominated by dry or rainy weather for several days. The right side of the omega block will have below normal temperatures while the region to the left will have above normal temperatures in this case. 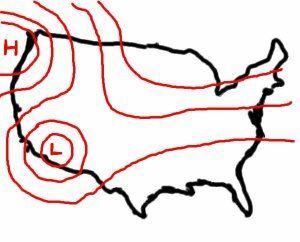 The Rex block in this case is hugging the West Coast of the U.S. A Rex block sets up with a strong high-pressure ridge adjacent to a strong low-pressure trough. A large ridge is north of a large trough. 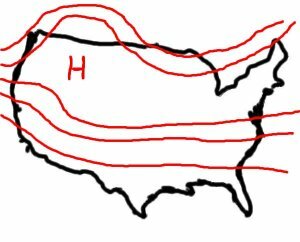 Air flow in the north Pacific curves around the ridge and then around the trough in the Southwest US. This causes the air to swing in loops near the same longitude but forces the air to a much lower latitude. The wind flow makes little progress to the east due to the "half figure 8" rotation the air must endure. This high pressure cell, which is an extension of the Bermuda-Azores high, can become fixed over the same general region for several days, especially if the jet stream is weak and with a lack of Canadian cool fronts. The air is most stable at the center of the high pressure. At the edges of the high pressure, the cap will be weak enough to allow afternoon convection to occur. This afternoon convection makes a ring around the high pressure cell. The afternoon thunderstorms will also rotate in a clockwise manner around the high pressure cell. 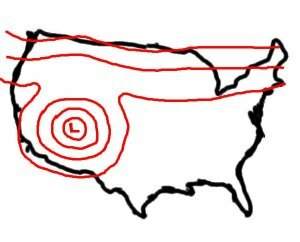 A common thunderstorm pattern in a Ring of Fire episode would be to have thunderstorms along the Gulf Coast and an arc of storms from the Great Plains into the Great Lake states. The Ring of Fire is originally a geology term which describes the occurrence of earthquakes and volcanoes as being on the edge of plate boundaries. In meteorology, the thunderstorms are synonymous with fire. Weather systems flow quickly through each branch of the jet but the weather pattern becomes stagnant in the region between the two jets. Several height contours encircle the low at upper levels. A cut-off low is more dramatic than the one shown in the rex block example. They can persist for several days, bringing several days of rainfall underneath the areas they park. They occur commonly off the coast of California but can develop anywhere.